Oh, it’s been so very, painfully long since I last wrote a post. I’ve been minimally active on other social media (not following Thimble Minds yet? Click here), but have had a few things to deal with, such as my health and looking for somewhere new to live, which can be quite tricky when your other half demands a garage and you demand a sewing studio! Speaking of sewing studios… I have reclaimed mine from becoming a storage room (see Sewing Room Sabotage). I have space, light and freedom to sew again. So let’s get back to it, shall we? 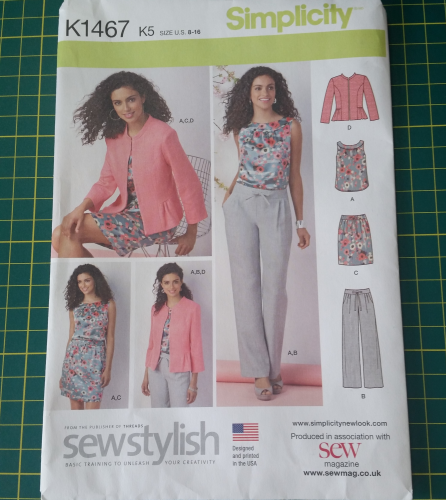 Another freebie with Sew Magazine, Simplicity 1467 consists of 4 garments – a peplum jacket, sleeveless blouse, pull-on trousers and a skirt. I decided to make the sleeveless blouse/top, View A. I wanted to make it with Tula Pink’s Aurelia Azure, and played around with a swatch and a sketch. I decided to see if the top would even suit me first. I found a lovely light fresh green double duvet cover in a charity shop for £1 and decided I would make the top in this first, before deciding to hack into anything “precious”. The pattern is sized at U.S 8 -16 – that’s a “sewing pattern 16” not a store bought 16. I wear a UK size 14 – 16 depending on how much room I want and how much salad I’ve dodged. My bust is 42 inches (upper bust is 38), waist is 34 and hips are 40. This means that, in order for something to fit well, I’m best either sewing either a pattern size 18/20 or a size 16 and doing a full bust adjustment… which I admit I haven’t got the hang of yet. This pattern, only going to a 38 inch bust, had me worried. I looked at the finished garment bust size, which is 42.5 inches maximum. A. Lose weight – I struggle to lose weight. Doctors are currenlty investigating me for a suspected thyroid problem. If it’s not that, I just plain don’t try hard enough! B. Sew a smaller seam allowance around the waist and bust – by sewing with 0.5inch less seam allowance, you a couple of inches to the garment. Not an accurate method if you reduce all of the seam allowances, but gives you a bit more room. You’re essentially “letting out” the garment a bit. C. Learn how to grade the pattern up to the size you need – In an ideal world. But I’m impatient and want to sew. I will learn… but only once I’ve mastered more of the basics of dressmaking. D. Full bust adjustment – works if the bust is the only problem. Typical sewing patterns are designed for a B/C cup. If you’re rocking FF/G’s like moi, then learning this is vital. So I did… None of those things!! I trusted my instincts that the top was going to fit. I also trusted my instincts that it wasnt going to flatter me. Big busts & baggy clothing = no… no… NO! I’ll finish it. I’ll even wear it a few times… and, like most things I’ve made so far, relegate it to the rail of disappointments. You never learn if you don’t try! This style of top is now added to my “does not suit me” pile. Have you used this pattern? How did yours turn out? You have are beautiful and that shirt does nothing to highlight your lovely curves! The four big US pattern companies strike again…I really feel they should be geared more to the expert level sewers who can modify the hell out of them to get great fit. For novice, and anyone who doesn’t want to re-create the dang pattern, I say stick to Burda, Ottobre Woman designs, and Japanese patterns. They are not only true to fit, but are super fashion forward. You have to trace your patterns and add in the seam allowances and hem allowances when tracing, but totally worth it. Well done for persevering. I’ve lost count of how many outfits I’ve made that I end up not wearing because they don’t fit properly, or I’ve chosen the wrong fabric for the garment. But if you don’t keep trying you’ll never learn, I think we’ve all been there!